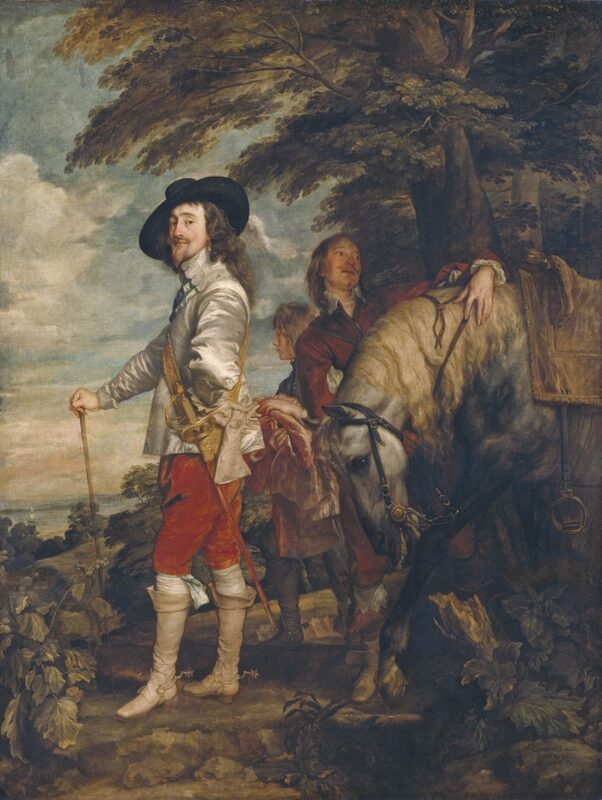 Over the course of his reign Charles I and his wife Henrietta Maria built up, through commissions and acquisitions, one of the world’s greatest art collections, only for the majority of it to be sold off in the Commonwealth sales just weeks after the king’s execution in 1649. 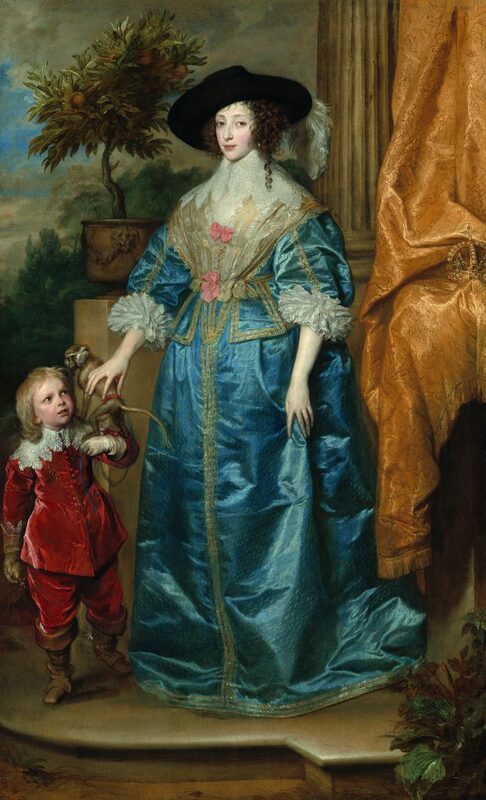 While the Restoration in 1660 saw many pieces in the collection gifted to or bought back by his son, Charles II, many of the greatest works remained on the Continent. This is why the stunning full-length painting of Charles V with a Dog by Titian hangs in the Prado, Madrid, and van Dyke’s Charles I in the Hunting Field forms part of the central collection of The Louvre rather than the Royal Collection. The collection found its roots in Charles’ 1623 trip to Spain two years before he succeeded to the throne. Hoping and failing to find a wife at the Spanish Court, he returned with Titians, Veroneses and a portrait (now lost) of himself by the famed Spanish court painter, Velazquez. Spurred by this trip, competition with other English nobles, particularly Thomas Howard, Earl of Arundel and George Villiers, Duke of Buckingham, and the encouragement and aid (particularly regarding contemporary artists worth buying) of his wife, he built up the most spectacular collection. By the time of his death it contained 1,500 paintings and 500 sculptures, according to the inventory by the first Surveyor of The King’s Pictures. The impressive inventory is on display in the exhibition. This striking exhibition brings together 140 (90 from the Royal Collection) of the best items from the collection for the first time since it was sold off in the seventeenth century. As you go round you will see in the blurb for many of the works the cost that they were sold off for, an interesting insight to which artists were valued most and how this has changed over time. 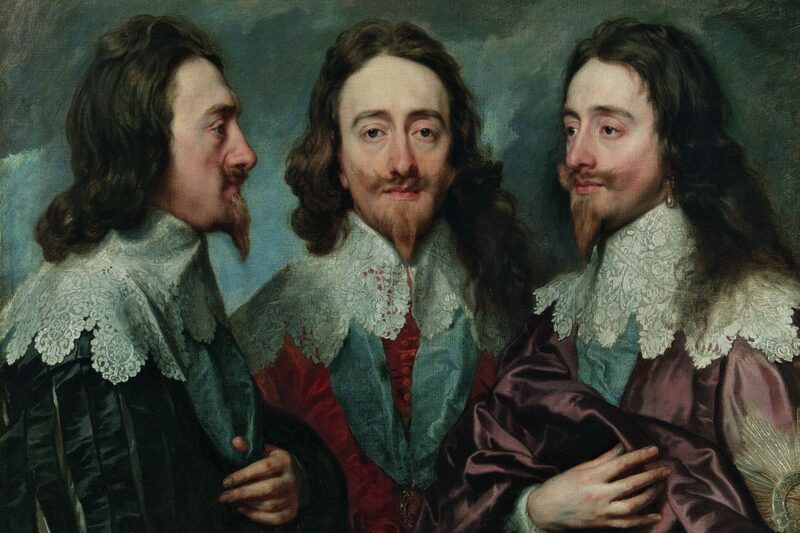 Charles I: King and Collector focuses on the three main areas that Charles focussed his collection on. First there are the contemporary artists he commissioned, especially Anthony van Dyke, to produce portraits of him that elevated his standing and magnificence. Then there is his collection of works from the Northern Renaissance, particularly Dutch, Flemish and German works, and finally his collection of Italian Renaissance works. Each area of focus contains one masterpiece after another by one great artist after another – Titian, Holbein, Bruegel the Elder, Mantegna, Tintoretto, Correggio, Rubens, Veronese and van Dyke. 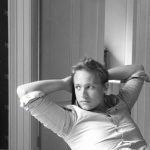 It opens by introducing us to the main characters behind the collection before leading us through to one of its crown jewels – the Gonzaga collection. 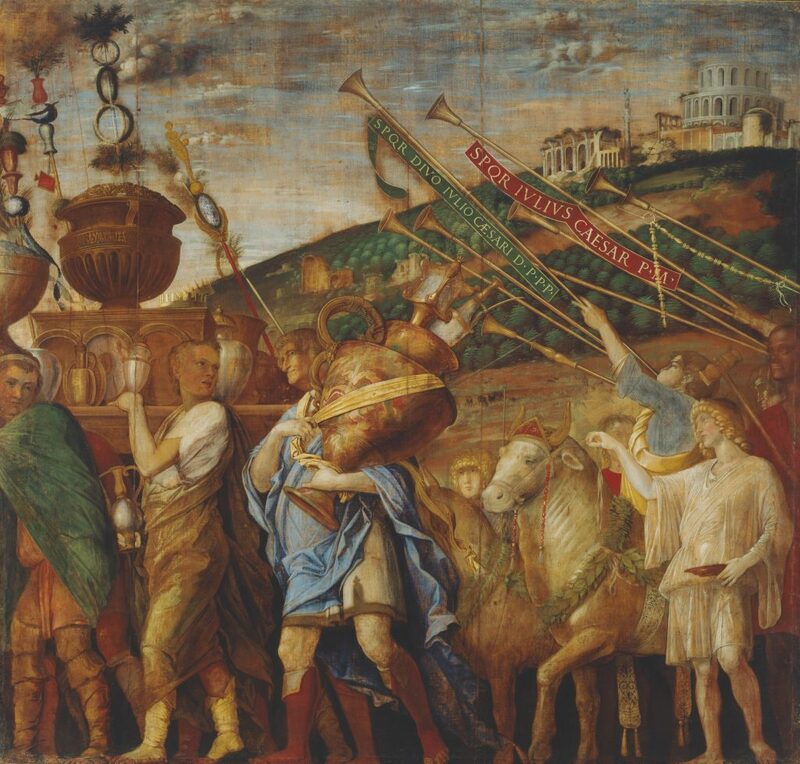 Acquired from the Gonzagas (the Dukes of Mantua) it contained The Triumph of Ceasar. The acquisition of this set of paintings by Mantegna was a coup for Charles; famous across Europe, they were perfect for a king so wedded to the idea of The Devine Right of Kings. While theses paintings are huge in size, some of the finest works are at the opposite end of the scale. Three Soldiers by the elder Bruegel and Holbein’s miniatures of Whitehall and the Tudor court are breathtaking in their delicacy, fragility, and gracefulness. The works of van Dyke break up the exhibition in two groups: the portraits of Charles and his family, and the equestrian portraits of Charles that we are so familiar with and were key to his depiction of power and divine right. A word should also be said about the tapestries from the Mortlake Workshop, based on Raphael’s cartoons. By far the largest items in the exhibition, they were also the most costly given the man-hours required in their production. Most exhibitions have a central core of works supported by other pieces of slightly lesser standing that help provide context. Not so in this case. Right from the start it is an exhibition of one exquisite work after another, forming one of the most magnificent and impressive exhibitions you could hope to see. It leaves you with one overwhelming thought: that the selling off of the collection in ‘The Sale of the Century” was one of the greatest art crimes and crimes against Britain to have ever been perpetrated. It’s almost enough to bring you to tears. Charles I: King and Collector is a must see! P.S. consider pairing it with a visit to the Charles II: Art & Power exhibition at The Queen’s Gallery.